Combined Task Force 150 (CTF 150) operations continue in the southern Red Sea, Bab el Mandeb strait and Gulf of Aden, some of the most frequented waters in the world. The third phase of this recent operation under the French command of the CTF 150 started yesterday. Indeed, after the planning then the integration phase of the different units that would have been able to coordinate the different assets available, the operation enters in its execution phase. FS Somme and HMS Kent on patrol in the southern Red Sea. Alongside other CTF 150 units (France, Australia, Canada and UK) already present in the Red Sea, a Saudi frigate, patrol ships from the Yemeni Coast Guards, the Yemeni Navy and the Djibouti Navy are now playing a full role in the operation. Their exchanges enable to improve the mutual knowledge of the zone and to update the situation in real time. A lot of input that will help to fight against terrorism and its support networks in this strategic zone for the merchant vessels. In a few days, the operation will escalate again with the participation of civilian merchant vessels. 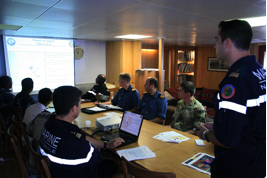 A planning meeting on board FS Somme with officers from HMS Kent, HMCS Toronto, FS Somme and Yemeni Coast Guard and Djibouti Navy. This meeting was focused on the attribution of the different zones of patrols. France has been in charge of Combined Task Force 150 for 3 months. CTF150 exists to create a lawful and stable maritime environment free from terrorism, smuggling and other illegal activities across an area of two million square miles, covering the Red Sea, Gulf of Aden, Arabian Sea, Indian Ocean and Gulf of Oman.